I don’t consider myself an affiliate marketer per se, I’m no marketing expert, but have drifted towards affiliate programs like Amazon and Clickbank as I’ve used my SEO skills to make money online. Google tends to hate almost anything that’s affiliate, especially when the content used is that supplied by the affiliate merchants with NO unique content: AKA thin affiliate content. Here’s my experience with making money from affiliate programs like Amazon and Clickbank: first wrote in 2007 and updated 2014. I had a couple of dozen Amazon affiliate stores (used Amazon’s XML datafeed and a Amazon store PHP script) that at one point (about 4-6 months after creating them) pulled in about 25,000 visitors per day (most of the traffic from a small number of popular sites I ADDED an Amazon store to) and it looked like within a year those sites would sell over half a million dollars worth of Amazon stock making me ~$50K a year from Amazon and a similar amount from Google AdSense! They still make money, but not enough to call them highly successful, lucky to see $1,500 cheques from Amazon now and AdSense is not what it was (still worth maintaining them). I looked on affiliate and AdSense income for that matter as free money, meaning never expected to make much and never planned to put a lot of effort into them, for example I used to give all affiliate revenue to my wife to spend on the family for days out and other fun stuff. But after experiencing the power of affiliate content ($10,000 cheques from Amazon make for a nice day out :-)) I should put a LOT more time into it. I wrote the above in 2007 after Google had pretty much destroyed all my Amazon sites rankings. In 2014 I’m making a fraction of the earnings I used to make from Amazon, but to be honest I’ve not really tried to make money again with Amazon (setup a few tests, but nothing serious), been really busy with SEO clients and health problems (only so many hours in the day). 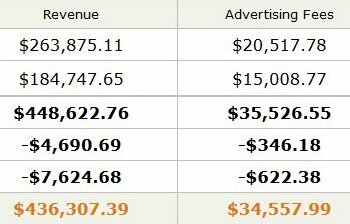 Below is a screenshot of pretty much every penny I made directly from Amazon, the money all but stopped by around 2009 (been around $200 a year since), so most of the Amazon earnings are when Google didn’t filter thin Amazon affiliate stores. Recently (late 2007) bought a PHP script that uses an affiliate datafeed to create a ringtone site. I search engine optimized the script (SEO), converted it to search engine friendly URLs (mod_rewrite) and added a nice template. Put it in a sub-folder of one of my older sites and added a few links (enough to make the main page around PR5). About 8 weeks in it’s seeing about 1,500 to 2,000 visitors per day (most from Google) and is making from affiliate/AdSense revenue about £10 ($18) a day. So if it stays this way that one script installation will make around £3,500 (~$6,500) a year. I could easily create a site like this a week using various datafeeds, but I’m wary because of my Amazon experience. Update 2014: within a year the Google traffic dried up and so I deleted the script and haven’t used it since. I tried the Clickbank affiliate program for the first time in 2007 and it went really well. Unlike Amazon and the PHP datafeed script with Clickbank I reviewed specific products I’ve actually used. With Amazon and the datafeed script it was tens of thousands of thin content pages that anyone could generate if they had the same scripts I had (I bought them online, so thousands of affiliates used them). 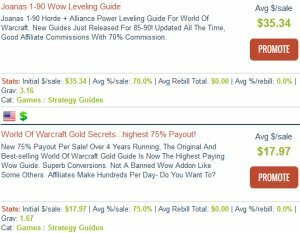 I was playing the game World of Warcraft with my eldest son and we bought a World of Warcraft Leveling Guide via Clickbank: to be precise my son found Clickbank, like I said I’m no affiliate marketing guru, my expertise is SEO. My son and I both wrote World of Warcraft Leveling guide reviews and as I’m so good at SEO quickly saw the reviews in the top 10 in Google for relevant SERPs. We built a handful of review articles promoting the leveling guides we used (tried several) and so this wasn’t a case of thousands of pages, but a handful of unique content reviews and they made a nice amount of affiliate revenue. 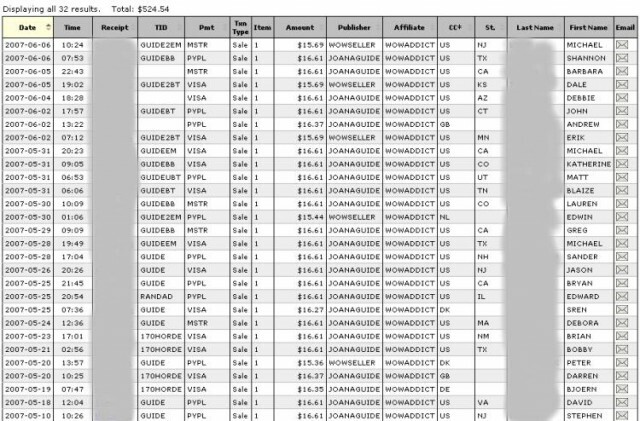 Below is a screenshot of Clickbank sales about a month after creating a few review articles. You’d think I’d have created hundreds of Clickbank product reviews by now (almost 7 years has passed by), but nope (did I mention I’m NOT and affiliate marketing expert :-)), over the years I’ve wrote less than a dozen Clickbank product reviews and just as bad NOT kept them up to date! I did a half arsed attempt at updating the reviews for the first update (up to level 80), but nothing since, so the search engine rankings and sales died off. Actually still had some OK SERPs, but few affiliate sales because the reviews stopped at level 70 to 80. Like having a review about Microsoft Windows and discussing Windows 3.1 and expecting visitors to buy Windows 8 based on how awesome Windows 3.1 WAS! A couple of days ago I updated one of the reviews and we’ll see how it goes. Never know that google so hate the thin affiliate content. Just start this online making money. Thanks for the remind. 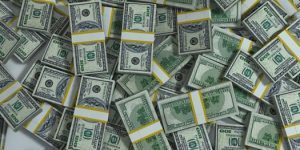 How to Make Money with Websites? Interesting stuff, I just don’t see how it’s possible to achieve great success with anything less than phenomenal luck and programming skill. I am pretty much convinced that unique content means little in the world of making money and it somehow has more to do with what goes on in the programming side. Case in point I have spent the last 2 years posting a new highly unique page about every 3 days of 500 or more words on average. I have posted many blog entries and have 8/9 live articles on ezine. I offer the only place on the internet to ascertain such information and yet my pr is 0. I have multiple pages in the top 10 on google for my keywords. According to yahoo I have 120 incoming links, according to alexa it’s 10. Still I have poured every day into this site and can’t come even remotely close to a pr3 though according to my host’s counter I had over 4,000 page views with 1200 uniques so far this month while producing over $300 in sales and clicks. My site isn’t an affiliate or blog site, just don’t understand the way of the world. I thought this was a very informative article. I’m new to affiliate marketing and haven’t had much success but plan on putting more effort into it from now on especially after reading all the comments at this post. I will be honest – I ditched ClickBank and AdSense altogether from my blog…. reason being there are too many merchants who’s products and services either get banned or leave ClickBank and as for AdSense, it gives visitors to your website another route to click and leave your site. If you have affiliate programs and products already on your site, you are guaranteed to make more money with them than through AdSense, unless your are driving some serious traffic.